Welcome to Amberfish Arts, home of Indiana Jones and the Fate of Atlantis 2, a sequel to LucasArts' famous adventure classic. Fate of Atlantis 2 (FoA2) is a retrogaming project which seeks to create a faithful rendition of the original's atmosphere and immersion through an entirely new storyline. 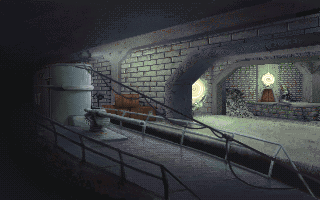 The game's story is set in the autumn of 1944, five years after the original. You can find out a little more about the plot in the story section. The group of fans dedicated to creating this sequel is no longer actively developing the game. Many of us have moved on to other ventures and do not have the time that it takes to keep such a project going. As such, development of the game has been halted, and the project is on indefinite hiatus. That being said, we have no intention of abandoning the dream to finish development and release the game at some point in the future. We'd like to do so if and when there is a viable option to get the project back on track. This webpage will keep you posted on any developments. Please don't hesitate to contact us with your questions or comments. This is a work of fan fiction. We make no claim to the characters, storylines, situations (whether trademarked, copyrighted or otherwise protected by federal, state or other intellectual property law) of George Lucas, Lucasfilm Ltd., Lucas Arts or any of their respective affiliates or licensees that hold rights to any intellectual property herein alluded to, used, expanded upon or in any way affected by this work. This work is produced solely for the personal, uncompensated enjoyment of ourselves and other Fate of Atlantis fans, in accordance with the "Fair Use" provision of Title 17 of the US Code. This work may be freely distributed provided each of the following conditions are met: (1) the above disclaimer accompanies all copies; (2) the work is distributed in its entirety, and (3) no consideration is requested or received. Distribution of this work not in accordance with the aforementioned procedures shall be deemed unauthorized and, as such, is strictly prohibited. This work and other materials posted to this web page are the sole creation and derivative work of the AmberfishArts Team, without license or permission from Lucasfilm or LucasArts, Ltd. Some images as seen on this website are the property of Lucasfilm or LucasArts Entertainment Company.